If you’re looking for a last minute Valentine’s Day gift for your love or best girlfriends, Popbar has the perfect treats for anyone with a sweet tooth! Forgot expensive chocolates from an overpriced boutique or cheap boxes from the nearest Duane Reade. Celebrate the day with chocolately love by ordering Hot Chocolate on a Stick. Available in Dark Chocolate, Milk Chocolate and Vanilla White Chocolate, these hot chocolate sticks will spoil your loved ones with a warm, indulgent treat perfect to enjoy on a February winter night at home. Hot Chocolate on a Stick is available in a 3 pack, 6 Pack Gift Box and a 12 Pack Gift Box. With the recent heat wave in the city, you may just want to sweeten up this Valentine’s Day with Popbar’s signature popSorbetto or popGelato bars. These pops are handcrafted daily in-house and are made with real fruit and all natural ingredients – no sugary juices or artificial flavors here! From strawberry sorbetto dipped in dark chocolate to mint gelato dipped in milk chocolate, there are a range of flavors for everyone’s tastes. And don’t forget, you can dip your Popbar in a variety of “poppings” from chocolate sprinkles to almonds. Stop by Popbar this weekend to pick up a gift box of Hot Chocolate on a Stick or surprise your lover on Tuesday with a freshly made, freshly frozen treat! 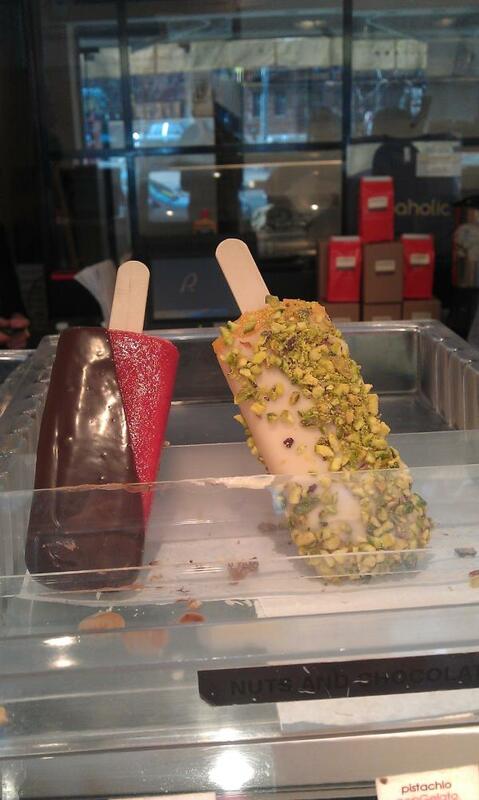 Visit Popbar to check out a full menu of flavors, dippings and “poppings”. I bet the vanilla white chocolate is delish!